One of the principals of Smart City Solutions (SCS), which enjoys an 80-percent stake in a parking meter deal with Georgetown’s Mayor and City Council, has been charged in New York in connection with the accidental shooting of a 1o-year old child. Semion Mosheshvili, 42, of Hewlett, N.Y., pleaded not guilty to charges of criminal possession of a weapon, criminal possession of a firearm, first degree reckless endangerment and endangering the welfare of a child. SILive.com reports that a 10-year-old who was shot Saturday in Prince’s Bay was rushed to the hospital by the shooter’s wife, according to the defendant’s attorney. Manhattan-based attorney Arthur Gershfeld made the point Sunday in Richmond County Criminal Court as part of an attempt to prove his client was not a flight risk. Mosheshvili, who is a longtime friend of the homeowners, was visiting from Long Island with his wife. Their five children also were in the house at the time of the incident, said Gershfeld. Police said the gun was licensed to a woman who lives at the house. Mosheshvili allegedly began handling the 9mm handgun on the second floor when it went off, said a police spokesman. The bullet pierced multiple walls, then the first-floor ceiling before entering the shoulder of the 10-year-old boy, sources said. The victim, who authorities said was a neighbor, was at home recuperating, as of Sunday afternoon, authorities said. Neither Mosheshvili nor his wife had an opportunity to speak with the boy’s family as of Sunday, said Gershfeld. Prosecutors requested $20,000 bail, based on reports he fled the scene before police arrived. But after hearing both sides, Judge Raymond Rodriguez set bail at $10,000 bond or $5,000 cash. 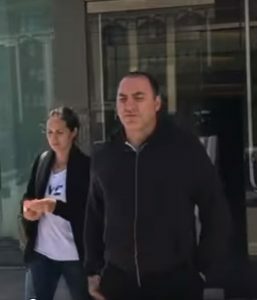 Mosheshvili’s wife was in attendance at his arraignment and paid for his release. Neighbors said they didn’t hear any shots Saturday, on what typically is a quiet street.